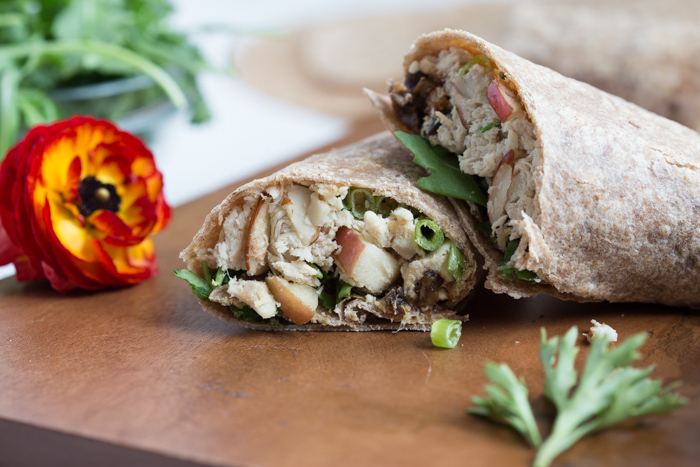 This Waldorf Chicken Salad recipe is light, refreshing, and a high protein lunch wrap made with rotisserie chicken, Greek yogurt, dried plums, and apples for a sweet and savory chicken salad wrap. Prep this ahead of time for a quick work week lunch. I love a sweet and savory lunch option and this recipe is one that I’ve made in my kitchen for a while and one that I can prepare in advance and eat off all week long. Rotisserie chicken salad recipe is great for a lunch or dinner meal prep option! There’s just something to love about a big ole salad lunch… but I gotta have my protein so that’s where this Waldorf Chicken Salad comes in. It’s protein packed from the lean shredded chicken and greek yogurt. When it’s too hot to heat up the kitchen, rotisserie chicken is my protein of choice for no-cook meals like this Chicken Waldorf Salad Recipe! Rotisserie chicken salad recipe is made with a combo of Greek yogurt and mayo – but if you dislike mayo, feel free to omit and use 100% Greek yogurt for a little protein boost! How to make chicken waldorf salad recipe? 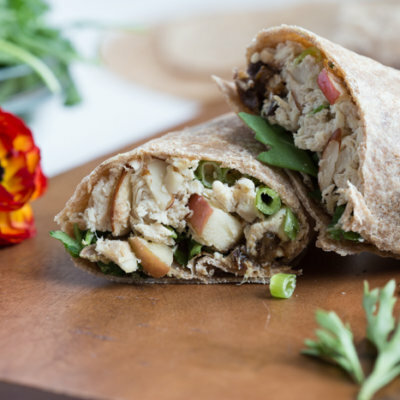 Like most chicken salad recipes on L&Z, this high protein lunch wrap is great for meal prep and assembled in just 15 minutes! In a mixing bowl, combine all wet ingredients – orange juice yogurt, mayo, and lemon juice. I suggest mixing these well first and then adding rotisserie chicken. Grab your tortillas of choice and scoop chicken salad mixture into tortilla. 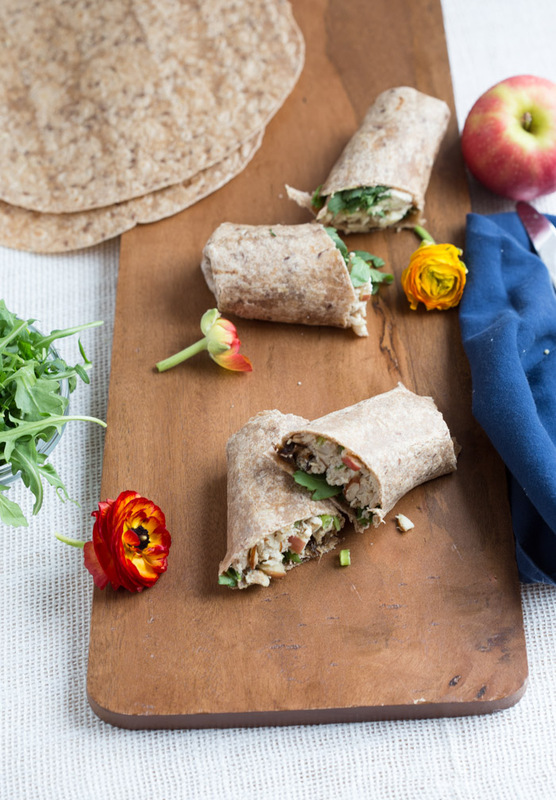 Top salad with arugula and gently fold tortilla together into a wrap. ENJOY! Ways to serve chicken waldorf salad recipe? Pile of greens. The way I enjoy chicken salad most often because I’m usually in need of a little more veggies on the daily! Wraps. Slightly more filling and also a great way to split up servings – enjoy half for lunch and half for dinner or save the second half for next day’s lunch! With crackers. Adds an additional crunch to the recipe so if you love a creamy and crunchy chicken salad, this is the way to go! By the spoonful. The ultimate time saver way to enjoy chicken salad – and probably the tastiest! I think this recipe takes me back to summertime because it’s just so light and refreshing. So easy to toss together and no cooking required. Less time spent in the kitchen = more time doing things that make me happy, like being with my family, working out or being outdoors. 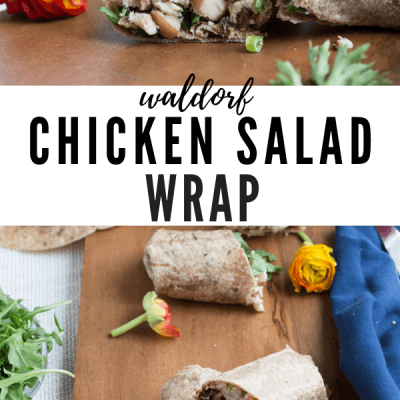 While these lunch wraps are mighty tasty, save your money and prep high protein Chicken Waldorf Salad Recipe at home for the week! I love to eat nourishing foods and the process of chopping and creating, but those DISHES though. That is the part I dislike and wish didn’t even exist. If we could just get rid of the dishes, life would be much better. Don’t you agree? Well, a girl can dream. But for now, I’ll take a big bowl of arugula and romaine lettuce with a good scoop of Chicken Waldorf Salad Recipe. 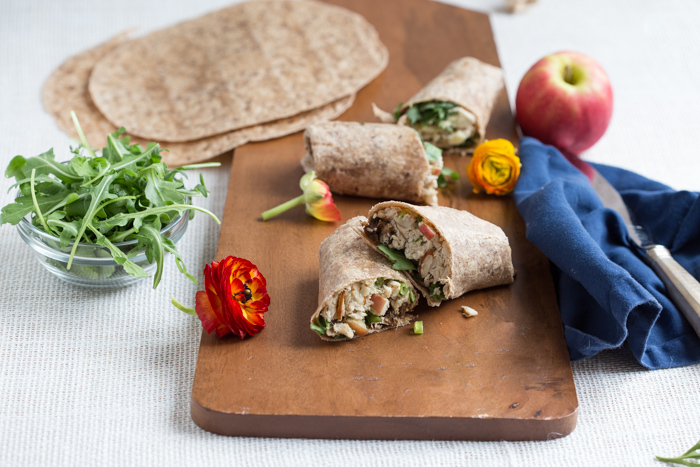 Waldorf Chicken Salad is a high protein lunch wrap with rotisserie chicken, Greek yogurt, dried plums, and apples for a sweet and savory chicken salad wrap. Toss chicken with yogurt, mayo, orange juicej, and lemon juice with fork until incorporated; season with freshly grated pepper. Fold in in apples, plums, green onions, and almonds. 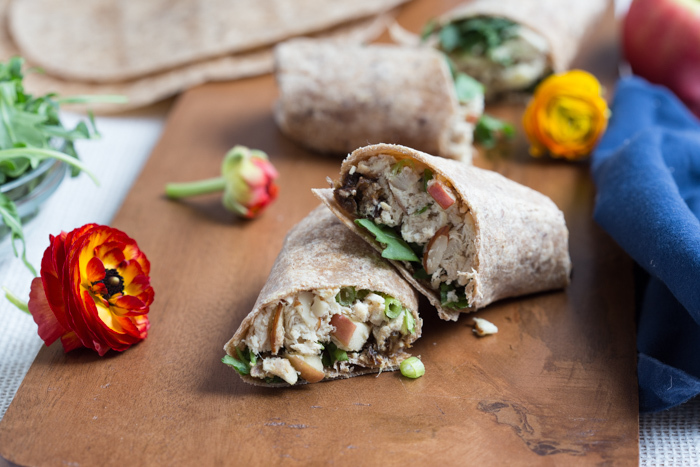 Wrap chicken salad mixture topped with arugula into wheat tortilla. Nutrition information includes whole wheat tortilla. 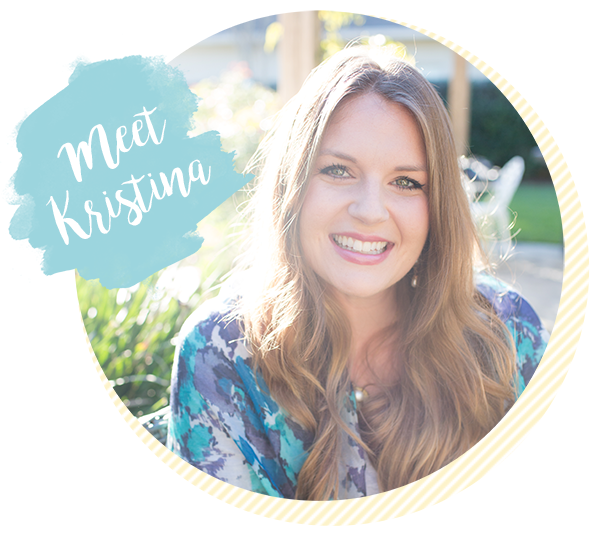 Hi Kristina -This recipe is a really good idea. I can put the chicken salad in a gluten-free wrap and feel like I am eating out. This sounds like it would make a perfect lunch! What a great way to re-purpose leftover chicken from dinner too! 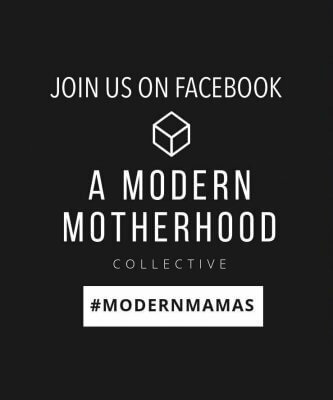 This sounds awesome! Any suggestions for those of us allergic to citrus? I would probably use apple cider vinegar instead. This looks so delicious I wish I had a rotisserie chicken right now so I could have this for dinner! Love the simplicity of this recipe—definitely updating a classic. This looks really good. It’s always great to have some recipes to prep ahead of time and bring to work! I love your addition of plums and yogurt to make the traditional waldorf salad much healthier! Beautiful! Great recipe and a nice twist on Chicken Salad, a mainstay at our house. I substituted dried cranberries for the prunes , threw in a couple T chopped pecans and 1/2 stalk celery, chopped fine (Mom always had celery & pecans in her Waldorf Salad). We thought it was too much lemon, so second batch I squeezed the lemon juice over the apple and only added apples w/o the excess juice. Just made this for dinner! Very tasty! 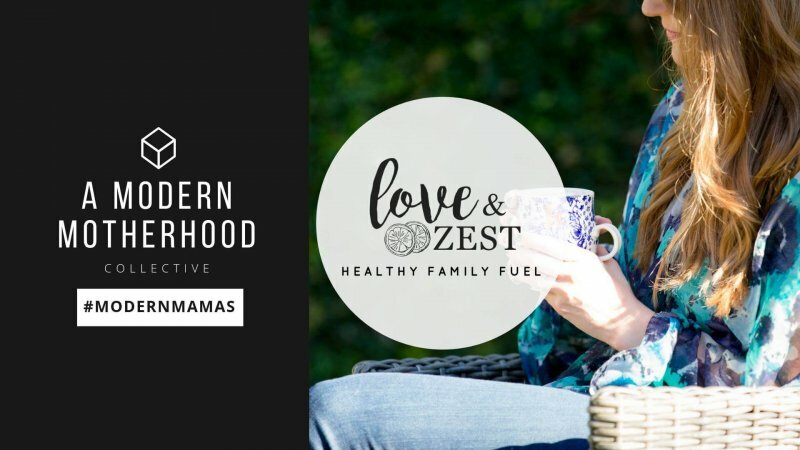 My husband doesn’t like mayo, so I love that you can use greek yogurt instead. Lucky for us I think there is enough leftover for lunch tomorrow. YAY!! So glad you and the hubs enjoyed it.